So You Want an Old Wood Boat? Get This Book For Free. A $35,000 Value. No, it’s not a signed first edition of Gone With The Wind. But it is more valuable. 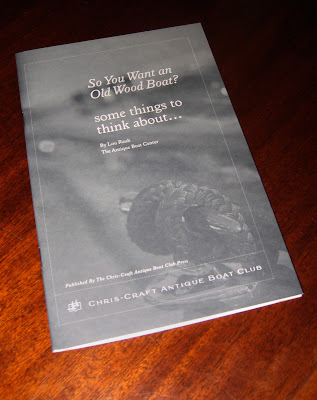 Lou Rauh from the Antique Boat Center in partnership with the Chris Craft Antique Boat Club put this book together. Lou is one of the nations leading experts on how to purchase and sell Antique & Classic Boats. This book is a great way to look before you leap. No one trying to sell you something, no hidden agenda. Just the objective learning’s of buying, selling and restoring thousands of Antique & Classic boats. Honestly I wish I had read it. OK, it was not out yet. But it would have saved me a small fortune. I run into folks almost every time I am out in my boat that tell me about the boat they are thinking of getting. This simple to read book is on my dash. I share it with them like a Jehovah’s Whiteness shares what ever it is that they share. How do I get this book. Do I need to hand out roses and bang on a tambourine…No.. But you have to sign up to the Chris Craft Antique Boat Club. You don’t have to shave your head or marry 25 women either… that’s a good thing… It’s easy to sign up, you can do it online. The retention rate in this organization is huge. The online forum… Boat Buzz, is bursting into the 2.0 world and very responsive. Go to the www.Chris-craft.org. and follow the prompts. If you’re apprehensive still, contact the club and I am sure they will be glad to give you one. But don’t tell them I said so. It will be our little secret. Just between us and 1 billion people.. mmmm I wonder if it’s available in Chinese? Update on WECATCHEM - I Am Feeling Unnatural Thoughts About My New Varnish Finish! ThanksKerry for reading. It’s a joy to do it. We post around 7:30 in the AM most days. Keep commenting, it keeps me going. Also if you have anything to feature, like a boat or project it’s fun to talk about readers stuff. How do i get a book ? I’ve only been in the wooded boat business about a year and a half. I started out with a 1959 cavalier 15′. It is a great boat but three weeks ago I bought a 1960 19′ capri and am out of space. The cavalier is not atht popular but I have grown quite attached. I am 43 years old. We need to get some young guys interested. I am on Norris Lake I I think that there are only 4 wooden boats on the lake and I have two of them. Great web site.